An easy, protein breakfast option made with ridiculously few ingredients. 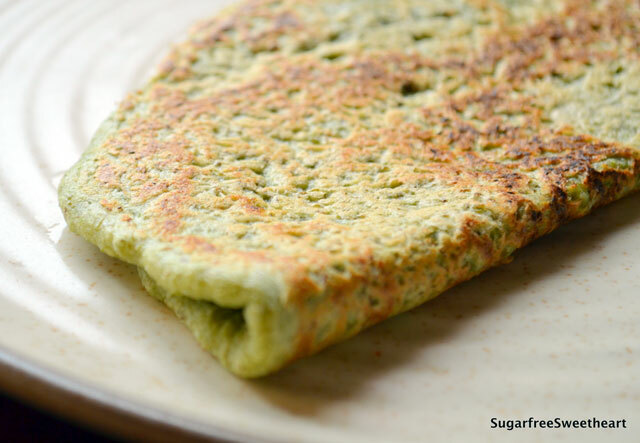 All that this moong (mung bean) pancake needs is a bit of forethought – and you can benefit from the nutrients of sprouts, the speedy preparation, and the yum taste, of course! Pesarattu, or moong dal dosa, is a traditional south Indian breakfast dish, often made with chopped onions, or combined with rice flour for a crispy version, and sometimes served with semolina upma. The recipe I’m sharing with you is the easy, elemental version of Pesarattu. I have used sprouted moong (in place of the usual soaked moong) for an extra boost of nutrients and for easy digestion. I prefer this simple version and often eat it plain but in case you’re looking for something more filling and fancy I’ve included some links for variations at the end of this post. Since this is a no carb recipe, you can make this when you want to have your favourite in-season fruit for breakfast (or elevenses)! And, if you have prepared the batter in advance, this pancake is an easy, healthy snack. This recipe is suitable for diabetics, weight watchers, and protein pancake enthusiasts! Then, get your pancake production line in order! And now, it’s time to make pancakes! Rinse the sprouted moong thoroughly before using. This gets rid of any unpleasant sprout-y smells! Ensure that the moong beans have at least soaked and softened a bit, even if they have not sprouted fully. So, check that there are no “dud” beans that are still super hard as these may not get ground. Use enough water to get a dropping consistency to your batter. It should be thick but spreadable on the pan. Ensure you put a slight but steady pressure as you spread the batter on the pan. It takes a couple of tries to get this right – so if you are new to this, don’t give up! Keep the burner on medium throughout the cooking of the pancake when covered, but lower the heat once you’ve flipped it over. 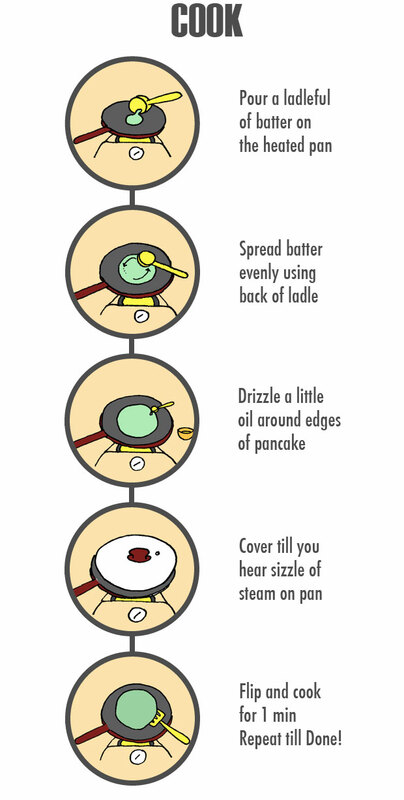 Cool the pan slightly between pancakes. 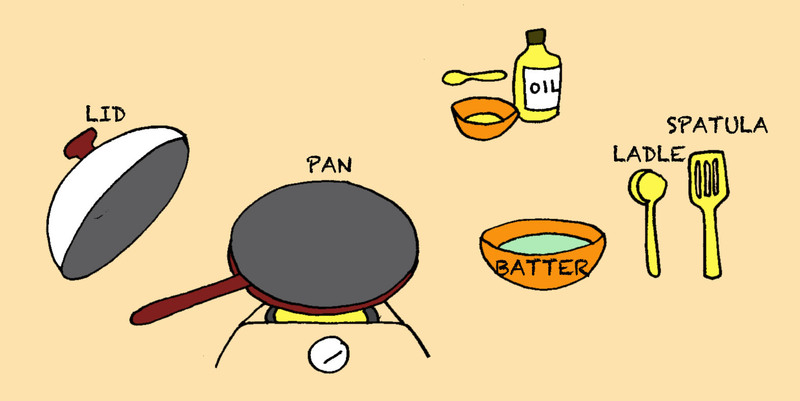 You can take the pan off the heat and even sprinkle a few drops of water to cool the surface. You can refrigerate the batter and store for a couple of days. I’m new to the sprouting crowd, but I’m a real fan of mungbeans! So if I understand correctly, the beans aren’t really “sprouted” just “started”..that is there’s no little tail going on, right? I try the same way,use sprouts as 100 gms is just 25 calories.My only problem is I find pesarratu (sprouted or non sprouted) with strong mung smell. Any tip how to curb this odour? I had this idea of making pesarattu with sprouted moong too. I’m glad I found it on your blog, didn’t have to experiment. This looks really good and I got a chance to try it out today. Awesome recipe, and very well put together! And, thank you for following my blog. Through yours I have been able to find many other bloggers too. Thank you, Priya. You’re so sweet! Now this my kind of breakfast!! I love it! This is the nutritious breakfast I need. I like your blog and the illustrations are amazing!! Thanks so much dr caligari! Illustrations make the whole blogging process slower but it’s worth it when they are appreciated! I just discovered your blog. Your illustrations are cool! I’ll be visiting again!! Thank you Anjana! I’m off to check out your intriguingly titled blog! Nice to “meet” you! Wanna try this! Looks very delicious! Oops, I meant Sadia! Sorry for the misspelling! Waw! What amazing, tasty sprouted moong pancakes! A must try! I have never tried these tasty pancakes before,…savoury that is! Those look great! Perfect for banana lovers! Hope you have fun trying these! This one is actually pretty simple! But you’re right seeing things in steps makes it feel doable! This is our daal ka chilla… very very nutritious! Nutritious and yum – the best combination! Ha ha! Yup, that makes it quicker – removes the planning part. So really no excuses not to make these! Glad you liked this, Paro.